Annuaire Conserv. Jard. Bot. Genève 20: 309 (1919). Growing habitat, over rocks in Paraguay. Origin and Habitat: Dyckia tobatiensis is a plant species of the genus Dyckia, native to the Tobati District in the Cordillera Department, Paraguay. Habitat and ecology: This species grows on rocky outcrops in open areas of selva paranaense on a flat plateau of sandstone among moss and lichens because of the high humidity of this area. It is often found growing together with sparce shrubs, grasses cactuses such as: Parodia nigrispina and Gymnocalycium fleischerianum. 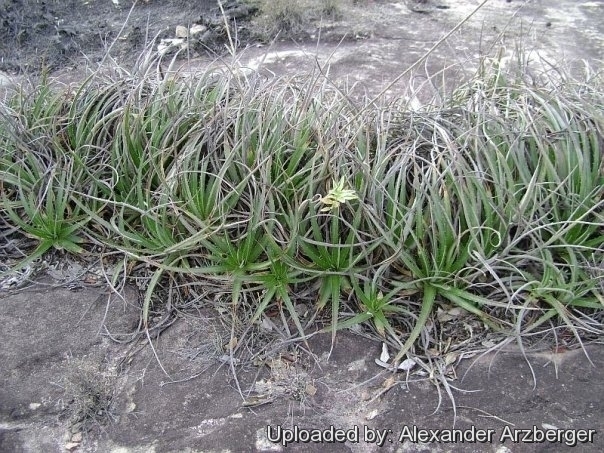 It grows in the thin soil covering containing sand from the decomposition of the rocks and relatively much humus from the decomposition of the Bromelia roots. It can tolerate harsh conditions. Description: Dyckia tobatiensis is a terrestrial bromeliad with wide, symmetrical, rosettes that spread out beautifully. The numerous, long, recurving leaves are green covered with white scales, which give the plant a silvery appearance. Leaves: Leaves of the rosettes elongate-triangular, 40-50 cm long, 3 cm wide at the base, thick, slightly succulent, leathery in texture, green, with greyish-white scales, above and underneath which give the plant a silvery appearance. Margins spiny. Spines triangular, much broad at the base 6-8 mm long, hooked above, apex lepidote often becoming brown, but never unclothed. Inflorescence: The flower stalk (scape) 0.5-0.8 m tall, hairless; sheaths much shorter. Leaves of internodes much shorter. The inflorescence is a 4-5-branched elongate panicle. The branches subtended by an ovate-mucronate sheath 10 mm long; they are about 15 cm long and few flowered. Flowers: Long pedicelled, 22 mm long (incluse pedicel). Pedicels 4-5 mm long. Bracts curved upwards shorter than the pedicel, triangular-ovate mucronate. Sepals oval, with perfectely rounded tip, 6,5 mm long. Petal-blades and base narrowly ovate- sub-rhomboidal 17 mm long, 8 mm wide, orange, slightly keeled. Stamens protruding above the flower-tube, the filament are free equal or slightly longer than petals. Anthers linear-elliptic, 3.5 mm long and 1.5 mm wide, the apex acute barely recurved, base dorsifix. Оvary pyramidal 10 mm high, style entirely exerted 6 mm, stigma globose, surpassing the anthers. Cultivation and Propagation: Dyckia tobatiensis is seldom found in cultivation.